Have you ever driven in whiteout conditions? It's not a pleasant experience, let me tell you. Thankfully, we have only experienced it a couple of times and each time it was only for a brief moment. Believe me, though, that's plenty long enough. Here's what it's like, in case you've never experienced it for yourself. The most recent time for us, we were driving home on the highway on a day with flurries and a lot of wind. There wasn't a lot of snow falling, but what had fallen was really being blown around. At one point, a car coming towards us flashed its lights in warning a couple of times, so Paul slowed right down and a few seconds later we reached a stretch of road with a lake on one side and a power dam on the other. With no trees to block it, the wind whipped the snow around so much everything around us vanished. We couldn't see the truck that was ahead of us, we couldn't see if there was anything coming towards us and we couldn't see the road. We also knew that anything coming behind us wouldn't see us and we were now travelling much slower than normal for that road, so we had to hope that anyone behind us had also slowed down before hitting the whiteout. It was crazy scary. A few seconds later, we drove out of the whiteout again and when we saw a car coming in the opposite direction, Paul flashed our lights in warning for them. As we drove the rest of the way home, I kept looking at the flurries that fell and marveling that something so small could so completely block our sight. That led me to think about the parable Jesus told about the farmer scattering seeds (Matthew 13:1-23). It's a long one, so I'll summarize: A farmer went out to plant seeds, but some fell on the path where they were eaten by birds, others fell on rocky ground where they couldn't develop roots, others fell among thorns where they were choked out and still others fell on good ground where they produced a crop. Jesus then explained that the seeds that fell on the path are those who hear the message of God's kingdom, but never believe. The seeds on the rocky ground are those who believe, but never grow deep roots so at the first sign of trouble they abandon their belief. The seeds among the thorns are those who hear the message, but the worries of life crowd it out so they don't do anything with what they've heard. And the seeds on the good soil are those who hear the message, believe it and live lives that help others to also hear the message. What does that have to do with driving in a whiteout, you ask? For most of us, "the worries of life" (v. 22) are small things, but when there are enough of them we can get so distracted that we lose sight of eternal things. We stop thinking about God much because we're too busy thinking about our worries. 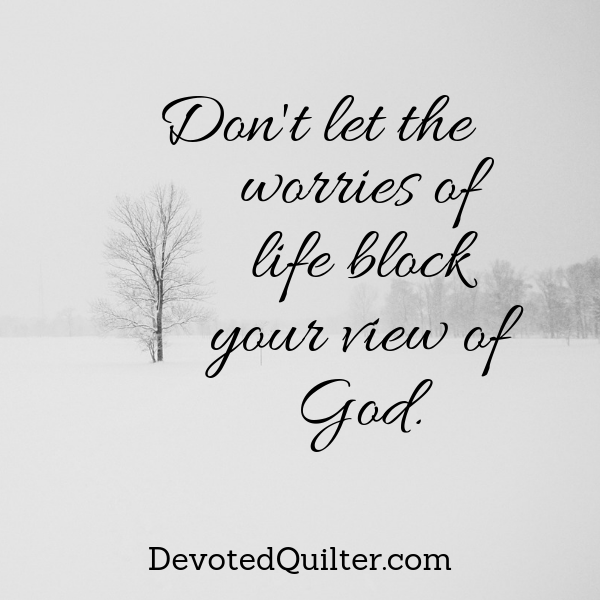 Letting our worries block our view of Jesus will keep us from really living for Him. Driving in the whiteout, we had no control over the snow or the wind. Likewise, we may not be able to change the circumstances of our lives, whatever they may be. They might be swirling around us, distracting and in the way. Driving in the whiteout, we couldn't change how much we could see, no matter how much we wanted to, but we can always change how much of God we see. We can choose to focus on Him despite the circumstances, by choosing not to focus on the worries. Yes, we still try to change our circumstances, if we can. No, we don't just give in and accept things that aren't right or that aren't good for us. But we also don't allow those things to block our view of God. We can keep Him in sight through prayer, through reading the Bible, going to church, listening to worship music...whatever it takes to keep Him in our days, even when those days are hard. We can't make our worries disppear, though that sure would be nice. While we work through them, though, we can make sure we don't allow them to block our view of God. Thank you! That is a helpful illustration and a good reminder.